This is a flavorful dish to serve with spaghetti or similar pasta, making a tasty everyday family meal. For sauce, saute the chopped onion in 1 tablespoon of olive oil until softened. Add garlic and cook for 1 minute longer. Stir in 1/2 cup chicken broth, wine, basil, and parsley. Bring to a simmer and simmer for 5 minutes. Add the cream, Parmesan cheese, and tomato sauce. Continue cooking until the sauce is hot and cheese has melted. Set aside. Place the chicken breast halves between sheets of plastic wrap and gently pound until uniform in thickness. Sprinkle chicken with salt and pepper; coat with the flour. In a large skillet or sauté pan over medium heat, cook the chicken in 2 tablespoons of olive oil for about 3 minutes on each side, or until browned. Add the remaining 1/2 cup of chicken broth to the pan; cover and continue cooking for 5 minutes. 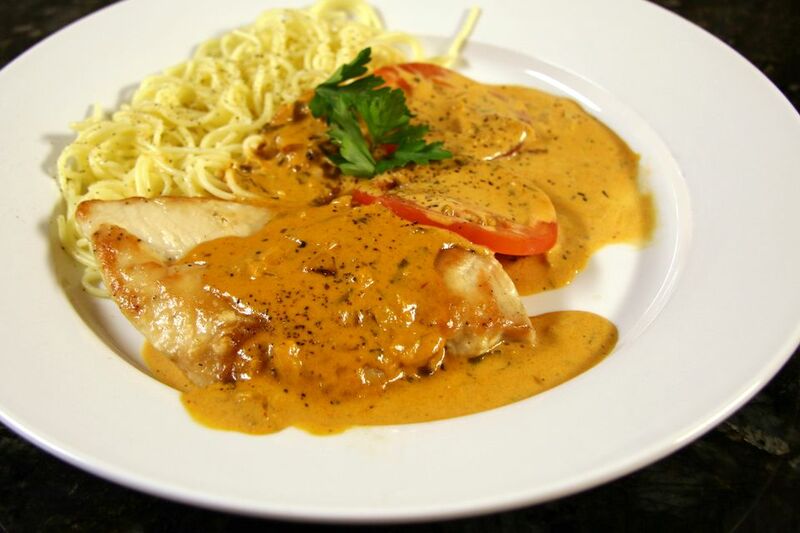 Add the tomato cream sauce, cover, and cook for 4 to 6 minutes longer, until chicken is cooked through. Serve with hot cooked pasta.